Posibilidad de navegar por carpetas de imágenes usando miniaturas. 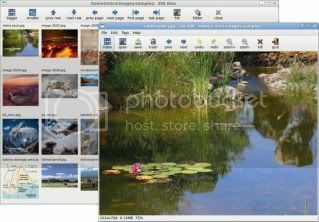 Posibilidad de importar imágenes RAW directamente de cámaras fotográficas. Remover ojos rojos con un click. Variar intensidad de los colores y escala de grises. Transformar fotos en dibujos simulados. Juntar 2 o más imágenes para crear una imagen panorámica. Agregar etiquetas, fechas, etc. a las imágenes. Seleccionar imágenes desde la ventana de miniaturas y quemarlas a CD o DVD (con Brasero). Varios idiomas entre ellos el español. A partir de la versión 12.02 solo podrán ser usadas bajo GTK3, por lo que en Ubuntu solo podrá ser ejecutado en Ubuntu 11.04 y posteriores. Menus now show a popup descriptions if the mouse dwells on the menu. Auto-synchronization (indexing of new image files) was made optional. If disabled, metadata edit and search functions are also disabled. These can be restored at any time by synchronizing the image files. The size of a printed image (in centimeters) can be set in advance. A 1-click sepia coloring was added (aged photo effect). If Linux standard trash and desktop trash folder both fail (possible with some distros) give the option to simply delete the image file. Painting and scrolling the gallery window was made faster. Navigating the gallery window to other directories was simplified. A gallery from an image search or collection can be discarded and replaced with a directory gallery using a toolbar button. Open file button also works. Bugfix: Edit Collections: keep the gallery window scroll position stable when adding or removing images from a collection. Bugfix: If the initial gallery window is list view (no thumbnails), then the gallery window displays only a blank window. Bugfix: Crash if a retouch function is "painted" with the mouse and and the function is canceled before any change is made. Bugfix: Show RGB [clear] button cleared image labels but not the dialog itself.